Learn more about Mephisto here. The only remaining German tank from World War 1, Mephisto is a special item for the Queensland Museum. It was captured by a largely Queensland Battalion. 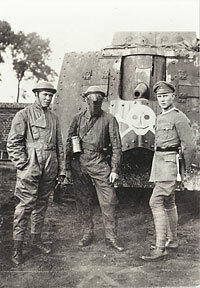 It is also unique: as far as we know there are no more survivors of the 20 A7Vs built by Germany at the end of World War 1. However a replica A7V was built in Germany in 1991 which draws heavily on Mephisto. Buy the Mephisto Pocket Guide from our online shop!